Seaweed is considered a super healthy food and that’s a secret that has been known to the Japanese for centuries. But these days people are more familiar with the delicate flavour. It’s the green wrap that we enjoy around our sushi. Shore Seaweed Puffs are a delicious snack and the Sweet and Smoky version has well-balanced flavour along with just a hint of seaweed. The crunchy curls make a perfect light snack, and made from a sustainable aquatic source, too! The Irish have enjoyed seaweed-based snacks for ages, but this is a healthy Scottish product. The raw material comes from the shores of Wick in Scotland. The Shore Company pickers are out in all weathers to hand-harvest the seaweed when it’s in season, at the right time of the day, in tune with the tides. It’s all rather romantic-sounding, although those Scottish winds can be bracing. Shore track and monitor the seaweed cycles and harvests, in order to protect the future sustainability of the quality seaweed for future generations. The company take only a limited amount of seaweed from each part of the coast. This allows for natural reproduction and regrowth. It’s a gift that, with good management, keeps on giving. This snack is high in iodine and a source of fibre, and contributes to your body’s normal energy-yielding metabolism. That’s nice to know, but it tastes good and that’s what will keep you buying more. Each bag is produced from a handful of freshly picked, super nutritious seaweed from Wick’s rugged shores. 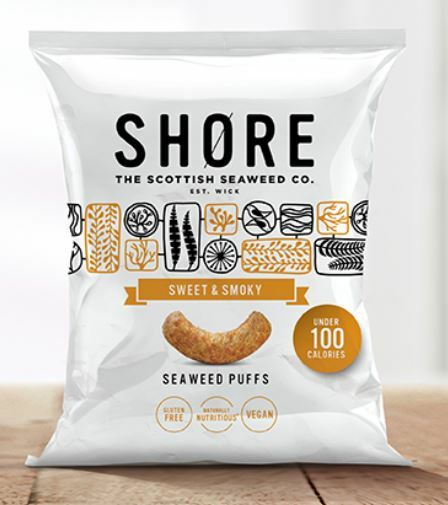 Over 6g of sustainably sourced, fresh seaweed is carefully air-dried. It has less than 100 calories, no trans fats, is gluten free, non-dairy and has no preservatives; it’s GMO free and is Vegan friendly. It’s a guilt-free nibble for everybody to enjoy. I look forward to tasting other Shore snacks. These Sweet and Smoky puffs were a winner!